Turkey Day is coming, and restaurants such as Mac 24/7, Duke’s Waikiki and Herringbone are holding their own holiday feasts. Thanksgiving Day is upon us and some of Oahu’s top restaurants are looking to share the aloha spirit in the best way possible, through food. So if you’re not up to cooking an entire holiday feast, or just want a place to take the family this Thanksgiving, give these restaurants, cruises and luau a look. 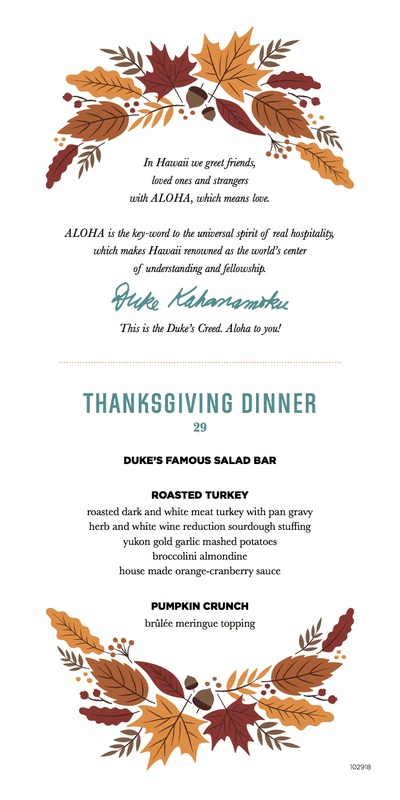 Find a filling Thanksgiving meal at the beachfront venue, Duke’s Waikiki. For $29 per person, enjoy the restaurant’s extensive salad bar, roasted turkey and garlic mashed potatoes slathered in a housemade cranberry sauce, and save room for dessert–a pumpkin crunch with brûlée meringue topping. $29 per person, 2335 Kalakaua Ave., Suite 116, Waikiki; the full menu can be found here. Excellent food comes at no small price, and Herringbone’s four-course $95 per person meal is well worth the money. Starting with a farmers salad, this dining experience will have you feasting on grilled Kona abalone and Diestel turkey and finishing the night with a pumpkin creme brulee. $95 per person, 2330 Kalakaua Ave., Waikiki; the full menu can be found here. Eat your heart out at the Thanksgiving brunch buffet laid out by everybody’s favorite comfort food diner. Options include candied Okinawan sweet potatoes, roasted turkey with traditional giblet gravy, paniolo roasted pork loin and autumn pumpkin pie tartlets. Pancake lovers won’t be disappointed either, as the restaurant’s signature pancake station, with 10 toppings, will also be available. $56 for adults, $28 for keiki ages 5-12, free for kids 4 and under, 2500 Kuhio Ave., Waikiki; the full menu can be found here. Make your way down to the posh Kahala Hotel & Resort and what you’ll find is an extravagant Thanksgiving meal at Hoku’s Restaurant. Five courses of nuanced and flavorful menu items, such as Hoku’s pork soup, a mix of crispy pork belly, andouille sausage, mustard seed and sweet bread crouton, are only made better by the wine pairings, which come at an additional cost. But hey, Thanksgiving’s only here once a year, so treat yourself. $100 per person, $45 for the wine pairings, 5000 Kahala Ave., Honolulu; the full menu can be found here. What’s better than a Thanksgiving buffet? A Thanksgiving buffet and a cruise. Set sail with Atlantis Adventures for a two-hour voyage in the waters around Oahu, all the while chowing down on a wide selection of turkey day menu items, such as roasted turkey and gravy, garlic mashed potatoes and the catch of the day. $109 for adults, $56 for kids ages 7-12, 177 Aloha Tower Dr., Honolulu; additional information can be found here. Those wanting to throw a little spice into their Thanksgiving Day dinner, look no further than the Waikiki Starlight Hawaiian Luau, hosted by the Hilton Hawaiian Village Waikiki Beach Resort. As you’re grinding away on the resort’s special Thanksgiving menu items, watch as exceptionally talented hula dancers, fire knife dancers and other performers move and groove on stage. This luau is outdoors, so when you’re not looking down at your plate or at the show, you can gaze upward and see the stars. $175 for adults, $140 for keiki, 2005 Kalia Rd., Waikiki; additional information can be found here. For a more low-key Thanksgiving Day, get away from Honolulu and Waikiki and head north. Paakai Restaurant, at Turtle Bay Resort, will host a three-course dinner with an optional wine pairing and a definite view of the sunset. All courses will have two selections, so dining on the petite filet of beef or the fresh catch is entirely up to you; a separate menu will be available for keiki (kids). $90 for adults, $17 for keiki, 57-091 Kamehameha Hwy., Kahuku; the full menu can be found here.